With no added colours, sugars and flavours, our Happy Belly Super Juice is great for the busy person who’s always on the go. As well as tasting great, you’ll receive the prebiotic and probiotics benefits. Containing ingredients such as echinacea and orange to give you high doses of the antioxidant vitamin C, Survive is the super juice you need to feel good without compromising on taste. Feeling great never tasted so good. We squeeze, press and blend the goodness in so you can get more goodness out. With our Body Temple Super Juice, we’ve added in Turmeric to help you get the most out of life. With no added colours or flavours, our Warrior Super Juice contains essentials such as Vitamin C to give you immune system support. The benefit is in the name; our Immunity Super Vege contains immune system booster vitamin C and turmeric, while being naturally lower in sugar compared to fruit juices. Feeling tired? Skip the morning coffee and give our Up Beet Super Vege a go. As well as having no added sugar, colours or flavours, you’ll also benefit from a good source of vitamin C.
Need to get your mental performance back on track? 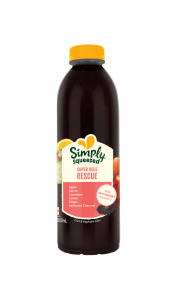 Our Focus Super Vege is a fruit and vegetable super juice containing carrot, passionfruit, cucumber, beetroot, lime, green tea and Vitamin B5 for mental performance. Additionally, this juice is naturally lower in sugar and also has no added colours, flavours or sugars.